Do not replace your floor because of appalling, horendous grout. 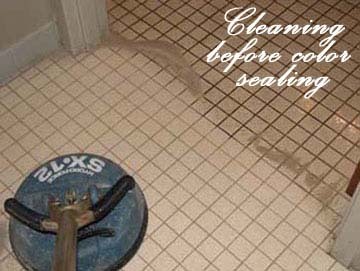 We will restore the color and appearance of your grout lines by color sealing it! Our Colour Sealer is a premium grade solid color tile grout sealant. It is oil repellent, stain resistant, breathable, flexible, waterproof, color stable and non-yellowing, provides better air quality impact than solvent based sealers and stains. 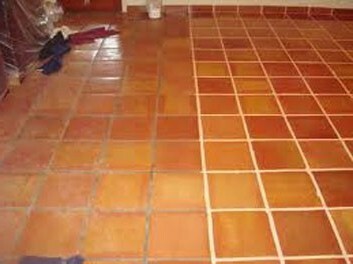 Often grout can take a beating from harsh cleaning, minor substrate deflection and general wear and tear. The grout plays very little structural role in the performance of the tiled floor and there is seldom reason to remove it if everything else is in order. Our Colour Seal is the thickest Colour Seal on the market and thus is capable of filling in the pits and fine cracks that other products leave exposed and also the most flexible Colour Seal available. It is capable of keeping the cracks and imperfections closed during minor deflections in the floor. Despite a very high solids content, it is designed to shrink while it dries to so as to conform to the natural contour of a sanded grout line. Combined with a matte finish and the texture from silica and aluminum oxide fillers, means Colour Seal dries to a very natural grout appearance, not a "painted" look. Our Colour Sealer keeps the grout looking great long after installation as well. It contains active ingredients that inhibit mildew growth on the sealer and exhibits superior stain blocking and resistance to household cleaners. Our Colour Sealer products can block not only the simple stains, like coffee, soy sauce & red wine from penetrating into the porous grout, but can also prevent many permanent stains. 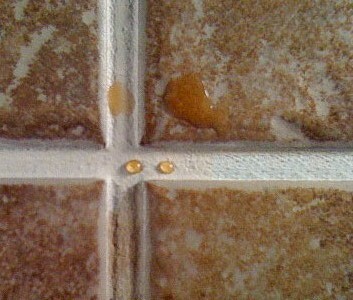 Oily build up clings to the surface of grout lines, attracts dust and grime, and becomes difficult to clean. Our Colour Sealer actually repels oils and fats and leaves the surface much easier to clean. Easy clean up means less need for harsh chemicals and abrasive cleaning. Provide a given degree of stain resistance and reaction time. Preserve and enhanse the appearance of grout lines. Protects against bacteria and molds. Make dirt and stain removal easier.